Hugh was born in 1885 to Captain John S. Allan and Ann Jane Allan, and was married to Grace MacDonald. Hugh was lost at sea while in the service of his country, being torpedoed by a Nazi U-Boat 200 miles south of the Port of Spain. He was chief engineer on the George L. Torian. The Steam Ship George L. Torain was a Canadian Cargo Steamer of 1,754 tons and built in 1926 by Earle’s Shipbuilding & Engineering Co., Hull for the Upper Lakes & St. Lawrence Transportation Co.Lts, Toronto. In February 1942 she was on route from Paramaribo to Trinidad carrying a cargo of bauxite. 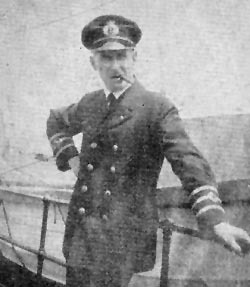 At 22.20 hours on 22 Feb, 1942, the unescorted George L. Torian (Master John Allan) was torpedoed and sunk by U-129 about 120 miles south-southeast of Trinidad. The master and 14 crew members were lost. Four crew members were rescued by a flying boat of the US Navy and landed at Trinidad. The Port Dover Legion Branch 158 is named in his honour. He is remembered on the Halifax, NS monument to the memory of the men and women of the Navy, Army and Merchant Navy who died as sea. He is commemorated on Page 85 of the Merchant Navy Book of Remembrance.